When you’re planning your wedding colour palette, ‘peach’ might not be one of your top choices, perhaps not even a colour you would ordinarily consider. It’s one of those slightly forgotten shades, but it’s time to take a fresh look at this delicate hue. Obviously named after the exterior of the fruit by the same name, consider it a soft, delicate pink. It’s the perfect choice for weddings – elegant and cool for summer celebrations and wonderfully chic when combined with white, grey or gold at a winter wedding. 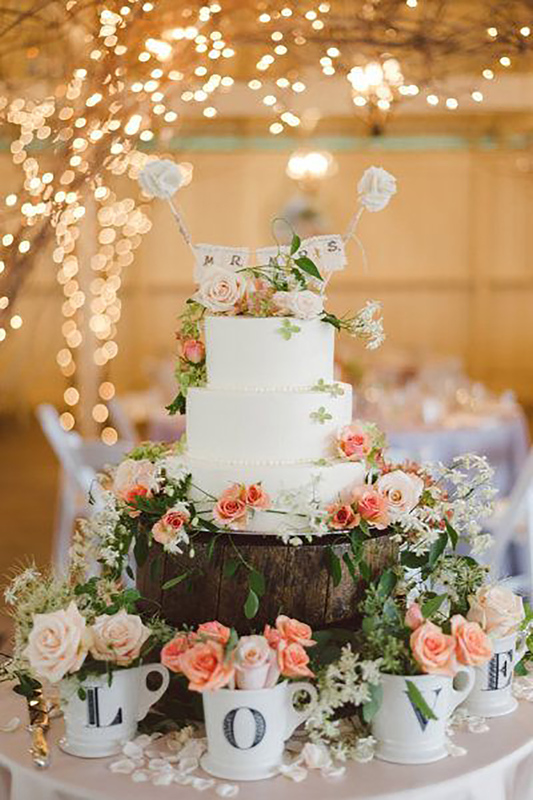 Let’s take a look at some beautiful peach décor. 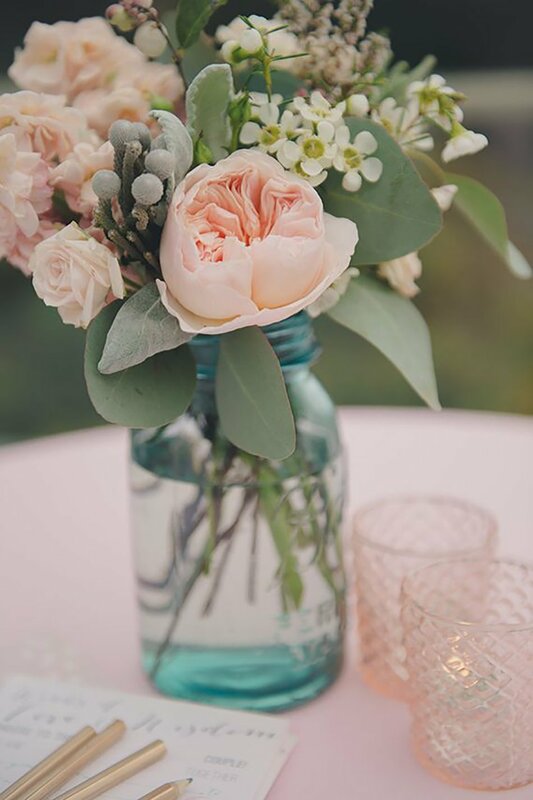 Nestled among greenery, these peach-coloured roses in glass jars make a pretty table decoration for a summer wedding. 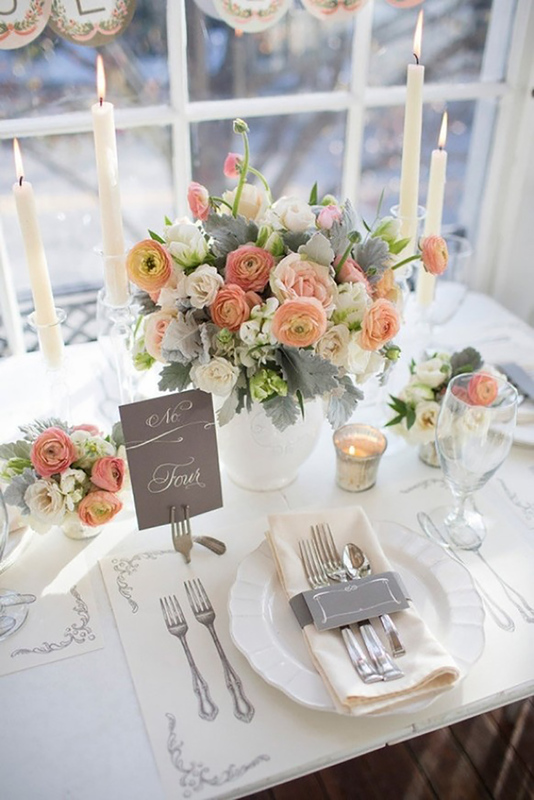 Peach and grey go hand in hand combined with white flowers to create a stunning table centre. 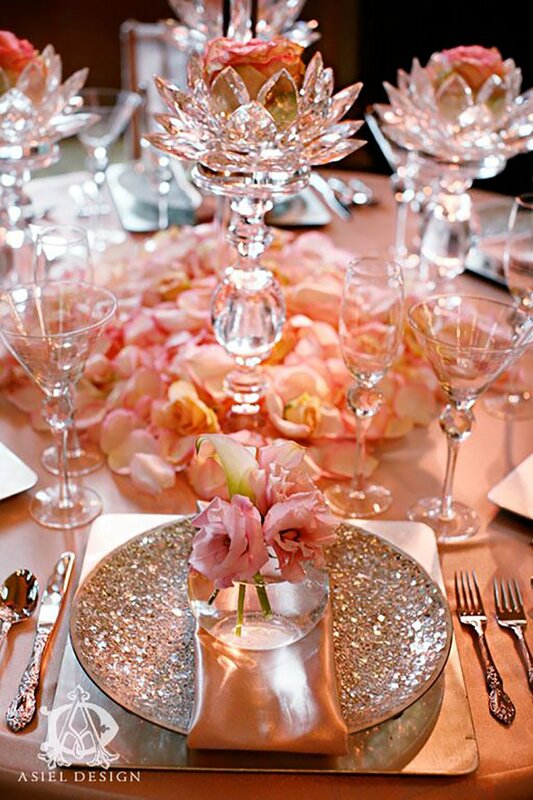 Silver votives add a splash of glamour, while white table linen sets the scene perfectly. This beautiful table illustrates perfectly how important it is to keep your table simple. As an alternative to grey, use gold to accompany your peach décor. Matt metallic can be informal and perfect for an outdoor wedding. We love these beautiful tables and the wooden chairs add to the more relaxed setting. Candles and twinkling fairy lights complete the look. For an evening celebration, turn up the glamour with touch of glitter. These base plates do the trick perfectly. Peach linen re-enforces the colour scheme and a neat, central scattering of flower heads and petals is an inexpensive way to create an effective centerpiece. 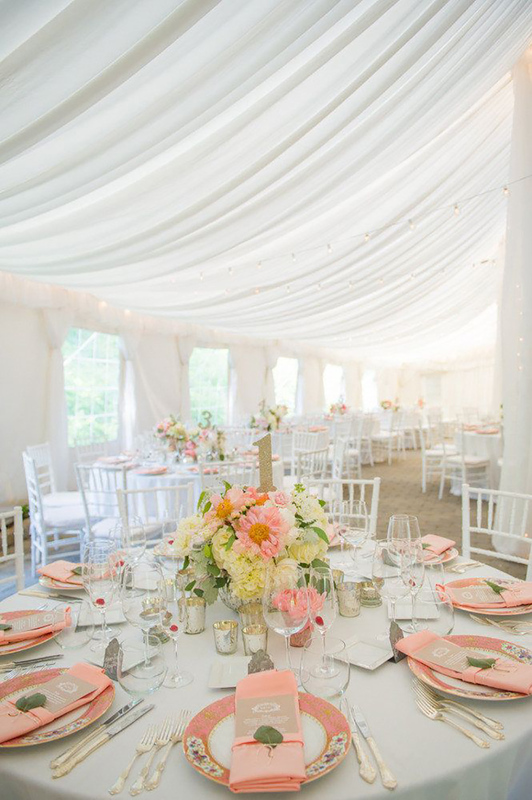 For a more vintage style, use white linen and chairs and adopt a delicate blush pink with just a hint of greenery. Hire vintage china (which can be mismatched) as your finishing touch. 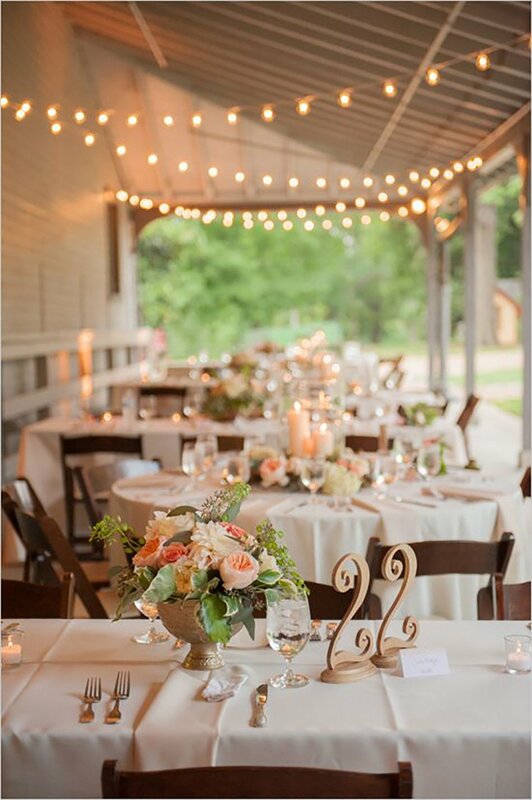 Hanging flowers or lanterns from the ceiling can set an impressive scene, looking particularly lovely as your guests enter the room for the first time. 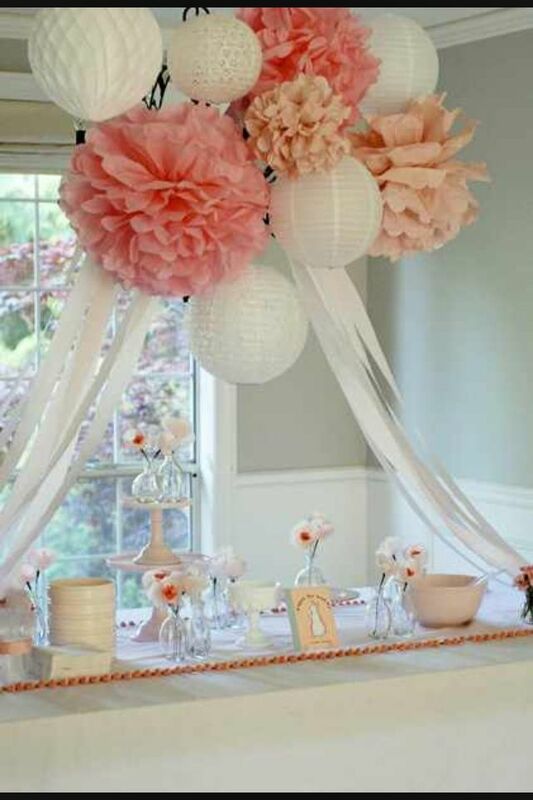 We love these paper lanterns and floral pom-poms. A well-thought-out colour scheme should even include the drinks. 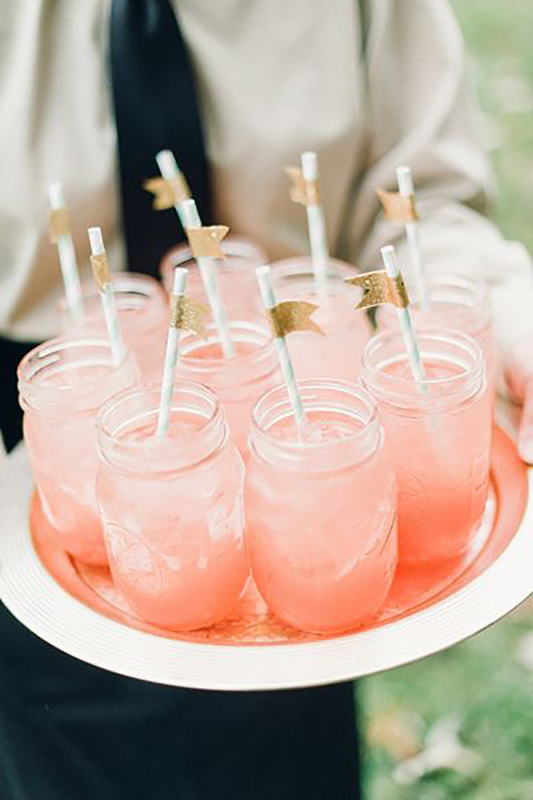 These dreamy peach cocktails are a thoughtful touch. Remember to make a non-alcoholic alternative and add some fun straws for children. Sometimes all a cake needs is a hint of your chosen shade. This stunning cake with its smooth white icing is as simple as can be. Adorned with fresh flowers, it is given pride of place on a beautifully decorated cake table. …Fairy cakes make a fun alternative to the traditional tiered cake. Consider presenting them on a cake stand, or even putting a few in the centre of each table. The icing should always be generous! Floral arrangements don’t need to be fussy and elaborate. 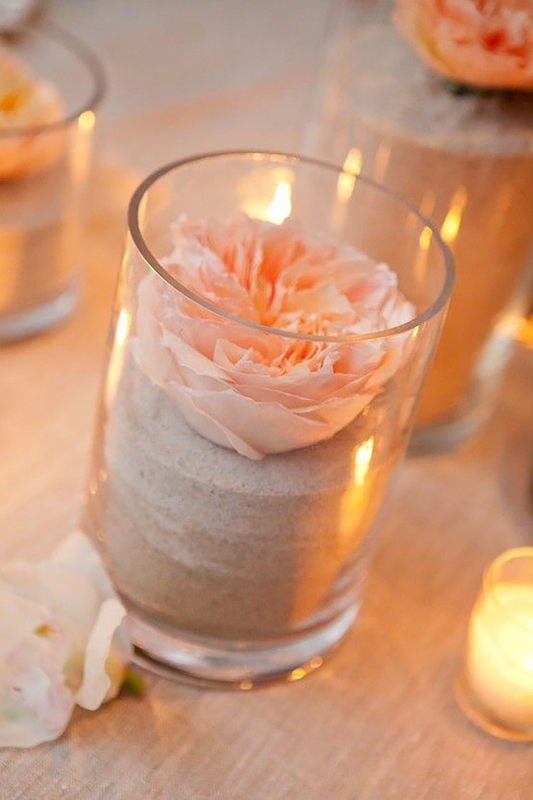 This rose head looks breathtaking presented in a votive with sand. How long it will survive without water is another matter! Consider using artificial flowers, which can look incredibly realistic. If you’d like to stick to ivory or white flowers, consider using colourful vases. 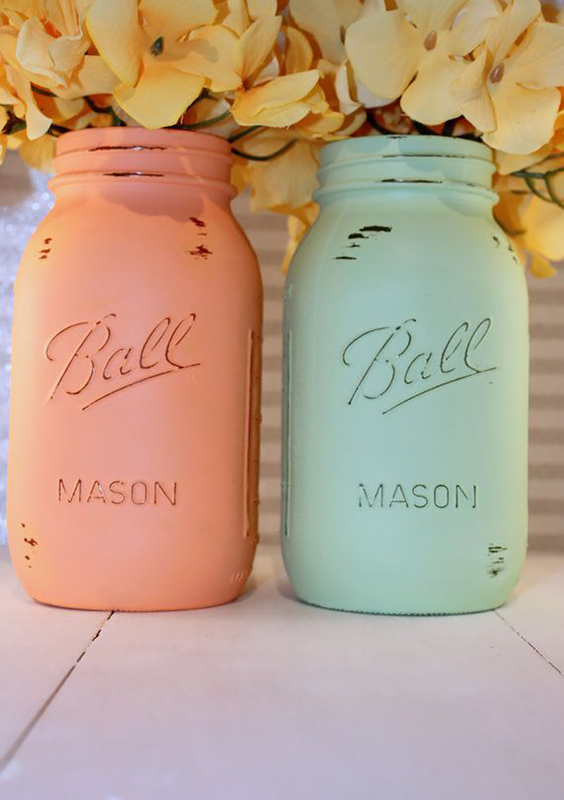 Mason or Kilner jars are easy to paint and work well with a boho styled wedding. 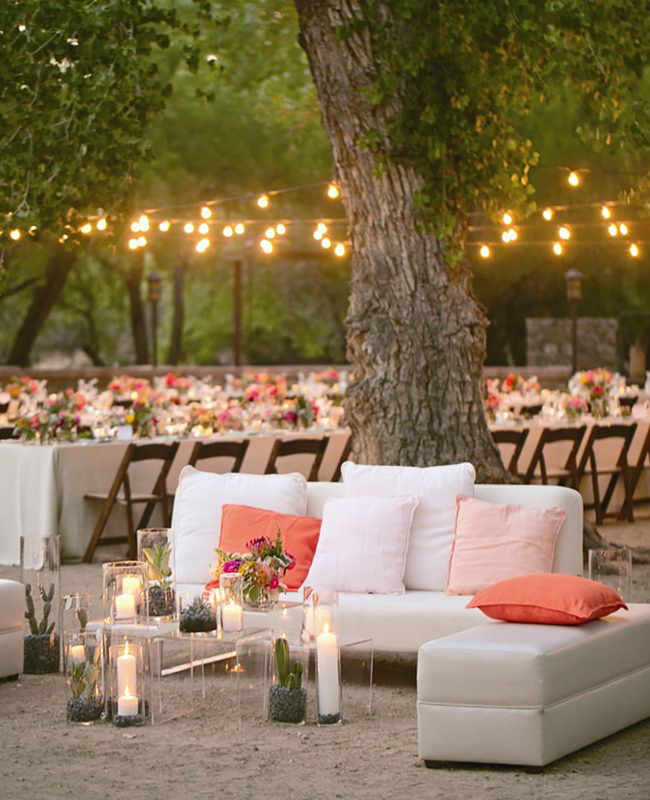 If you’re lucky enough to have an outdoor wedding, use peach sparingly, needing just a hint of colour to co-ordinate with the nature around you. We particularly love this chill out area with well-chosen scatter cushions. 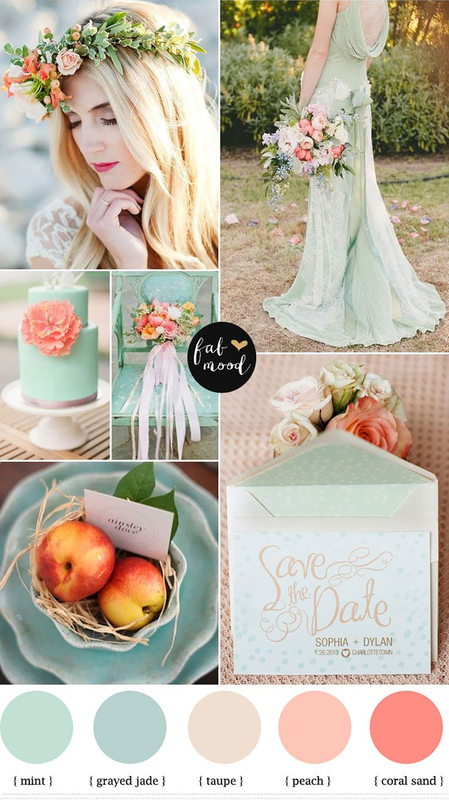 Blue, pastel green and soft grey are the colours we love to combine with peach. Take a look at these elegant weddings, where the theme runs through from the stationery to the bridesmaids’ dresses, cake and flowers. Consider every element of your special day to achieve that wow factor! Website Gives Brides and Grooms $10,000 Towards Their Big Day… But There’s A Catch!